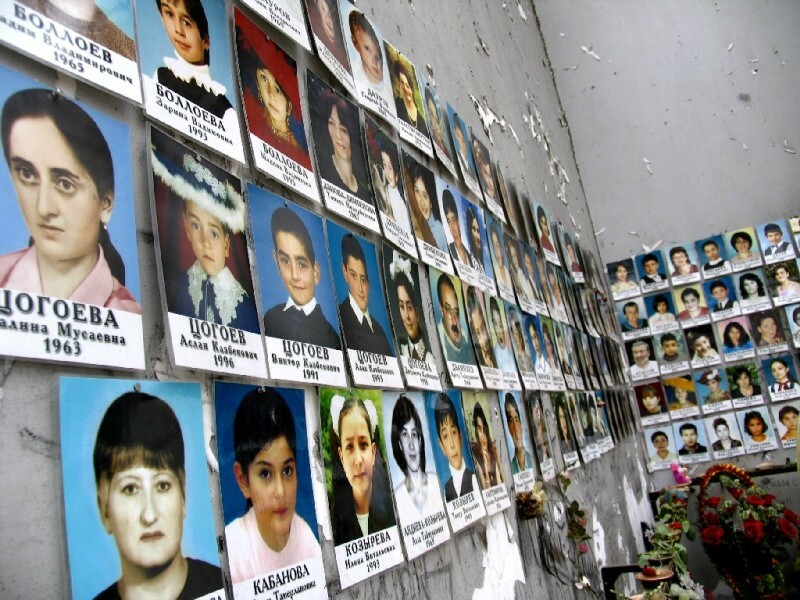 On a Wednesday in September 2004, the first day of the new school term, a group of 32 male and two female Chechen separatists broke into the Beslan Number 1 School yelling “Allah Akbar” and taking 1,128 people, including 777 pupils hostage. In the confusion, more than 50 people managed to escape. To ensure the building was not stormed by police the terrorists put children at strategic points around the gymnasium where they held their victims. The siege was well organized. Disguised as workmen, the terrorists had hidden weapons and explosives in the school in July 2004. The terrorists ordered everyone to speak in Russian and when one man, named Ruslan Betrozov, stood to repeat the rules in the local language, a terrorist shot him in the head. At 1pm the terrorists demanded an end to the Second Chechen War and then they executed between 15 and 20 of the male hostages. At 3pm the two female terrorists died after exploding the bombs they had wrapped about their bodies. Five hours later, the terrorists told a New York Times journalist that they belonged to a militant organization called Riyadh al-Salihin, led by Chechen warlord Shamil Basayev. The siege went into a second day and the terrorists refused to allow any food or water into the gym. It was reported that the terrorists and hostages had to drink their own urine. The Russian government, still with a Cold war mentality, claimed that there only 354 hostages and 15 terrorists. Russian President Vladimir Putin only made one public comment on the siege, to the fury of the terrorists and families of the hostages. The Russian authorities also lied, saying that the terrorists had made no demands. At 1.05pm on the third day two bombs went off in the gym, killing some hostages while others took the chance to try and escape. The terrorists opened fire on them. At 1.30pm the gym roof collapsed, killing more hostages. Ten minutes later, Russian forces moved in to end the siege. Some terrorists attempted to flee and five were killed. Pandemonium ensued as hostages tried to escape and terrorists fought back, using them as human shields. By 3.15pm most of the hostage were freed but 15 or so terrorists were still at large. One, Nur-Pashi Kulayev, tried to pass himself off as a hostage and was almost lynched when he was recognized. At 9pm 646 people were admitted to hospital. Two hours later, the authorities reported that they had killed 27 terrorists. On 17 September Chechen terrorist Shamil Basayev claimed responsibility for the school siege, saying the dead hostage-takers were in heaven and the killed children in hell. On 26 May 2006 the only surviving terrorist, Nur-Pashi Kulayev, is jailed for life. On 10 July 2006 Shamil Basayev was killed in the Russian republic of Ingushetia. The official death toll stood at 355, including 186 children.